I've been dreaming about being a Chi O for days, weeks, months... No, seriously, I'm not kidding. So today when I opened my bid card and read the words "Chi Omega," I just about pooped my pants. From there, it was nonstop hugging, laughing and smiling with my new sorority sisters. I was starving by that point, so when I heard that we were having breakfast for dinner, I was in heaven. The food was damn good; I ate my weight in hash browns, but WHATEVER. Today I am a Chi O and today I will eat whatever the heck I want. After dinner, we went "shopping," which basically consisted of us going to different rooms in the house to meet girls and get little gifts. I got sunglasses, a bag, a water bottle, candy... It was like trick-or-treating. But better. This post is getting long and so I'm just gonna sum things up right here: I am so thankful to be in Chi Omega. The girls are amazingly genuine (not to mention freaking HILARIOUS) and I love them already. Congrats girl. 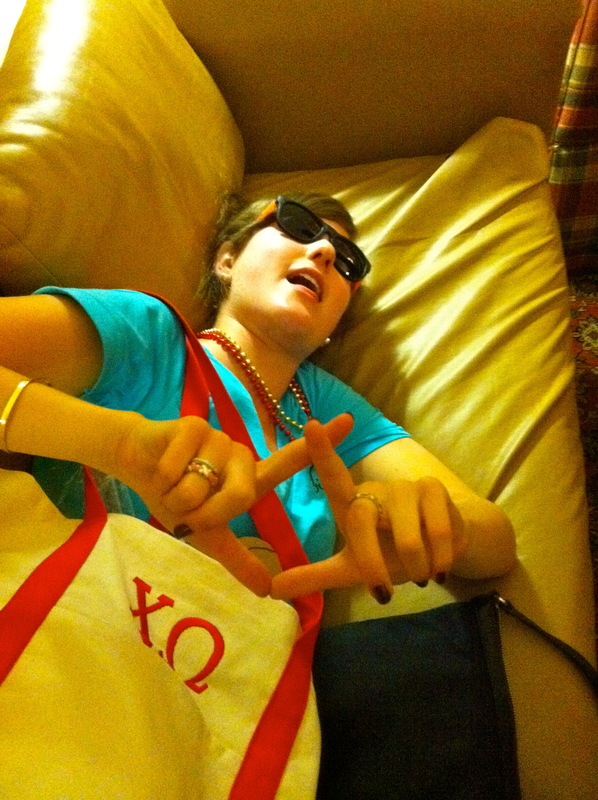 I was a fellow Chi O. Better make the owl your new favorite animal! i am in chi-omega agreement. rho kappa chapter ISU 1988. HAVE A BLAST - hOOt HooT!